by Eliot A. Cohen 2016, 228 pages. Sept 28, 2017, 7:30 a.m. to 9:00 a.m. The title of the book is taken from the speech by Teddy Roosevelt on September 3, 1901 at the Minnesota State Fair whereby T.R. made the memorable line “Speak softly and carrying a big stick”. The author is the Robert E. Osgood Professor of Strategic Studies at John Hopkins University, author of Supreme Command and Conquered into Liberty and former counselor to Condoleezza Rice at the State Department. 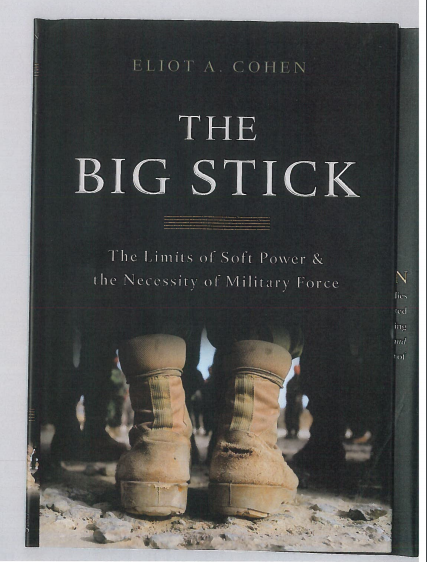 “The main argument of “The Big Stick” is encapsulated in its subtitle and its sly cover image, a close-up of a pair of boots on the ground. The author makes an unfashionable, unabashed and—above all---unwavering case for the use of force in the service of American security and ideals. To shy away from hard power, in Mr. Cohen’s view, would come at great moral cost in a world of irrational regimes, religious revolutionaries, cyber guerrillas and bellicose competitors like China and Russia.” (Jennifer Senior, “The Big Stick “ Argues for a Robust Military Role Abroad, The New York Times Book Review January, 2, 2017) Cohen argues that there are four major challenges faced by America’s foreign policy; the rise of China, global Islamist movements, states aspiring to nuclear status and ungoverned domains. Cohen takes the current unfavorable position that the US must take responsibility for global peace and, according to the editor, “…that hard power (military strength) remains essential for American foreign policy. While acknowledging that the United States must be careful about why, when and how it uses force.” The editor goes on to say, “If the United States relinquishes its position as a strong but prudent military power , and fails to accept its role as the guardian of a stable world order, we run the risk of unleashing disorder, violence, and tyranny on a scale not seen since the 1930’s.”In the conclusion of the book, Cohen says that presidents since 2001, unlike earlier times, must be much better prepared for, not only conflicts as they arise, but must be prepared with a strategic strategy to deter potential conflicts in the future. The footnotes, alone---35 pages--- are well worth the review. The hardcover is $28 dollars and the paperback edition at Amazon is $17.99 and on Kindle $18.99.